M Night Shyamalan has had his good films and his bad ones over the years, no question. One of his good ones was 1999’s Unbreakable. People are divided over this film and that’s fine. I found it to be absorbing and intense. It was a superhero movie before Marvel came along and developed it’s very own brand of comic book style and superheroes. Those films are fun and some are very good but Unbreakable is a superhero film more in the Christopher Nolan Dark Knight universe. It’s dark and realistic and quite sad. It’s premise was exciting; what if super heroes and master villains really did exist in the real world? This is what I loved about the film and why I had always hoped for a sequel. The film was only considered a modest success and so Shyamalan moved on to make the mega hit Signs (2001). The quality of his films thereafter declined as did his Hollywood status. 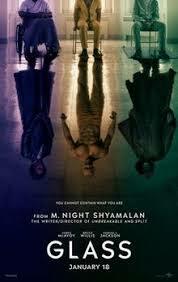 When Split came along in 2017 Shyamalan was experiencing a career resurgence and I was excited to go see the film, hoping for some of that old ‘Night magic”. I happily enjoyed the film! It was a solid thriller with a great performance by James McAvoy. 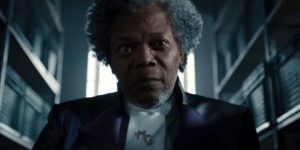 I would have been satisfied with that but when the score from Unbreakable started playing near the end of the film and the film continued beyond what would normally be an ending, I started getting suspicios. Then, we got that final scene in the diner. Everyone was watching the news on the TV about this terrible villain called The Horde. It reminded them of another murderer from the past with a funny name. “Mr. Glass” a voice rang out. It was Bruce Willis. It was David Dunn! We’re going to finally get that sequel!! I was downright giddy! Shyamalan was taking a chance though, by using his newfound Hollywood cache to make a sequel to a twenty year old mild success. Glass isn’t as good as Unbreakable or Split. 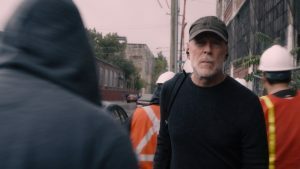 It depends mostly on the dynamic between the three main characters, David Dubb, The Horde and Mr. Glass and the secondary characters are mere witnesses to they’re drama. It’s a lot of pressure to put on the story and the action mostly takes place in a sanitarium where they have all. conveniently been placed. The film, however, works as ‘wish fulfillment’. It was fun to see these characters exist in the same world. The idea from the first film is still alive here. How would such characters be perceived in real life? They would be considered insane. The conclusion is a fabulous finale of super hero and villains in a duel to the death. There’s much fun seeing Willis and Jackson back in their original characters. I wish there was more interaction with them and rumination on what happened before and what David Dunn has endured since. It all seems to happen so fast. It doesn’t have the reflection of Unbreakable or the suspense of Split. We get to see Mr. Glass’ mother (Charlene Woodard) and Dunn’s now grown son, Joseph (Spencer Treat Clark) and accomplice back in the fray. 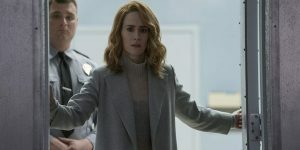 Sarah Paulson shows up as the psychiatrist tasked to study these men who has alternative motives.. Anna Taylor Joy also reprises her role as the sole survivor from Split who now all of a sudden has some sort of relationship with Kevin Wendell Crumb, the original identity of McCoy’s character. It’s uneven to be sure but as a fan of the first two films it was fun to watch how Shyamalan tried to make the third leg of a trilogy work. He is very inventive and willing to take chances. I hope that he continues to surprise and make entertaining films.